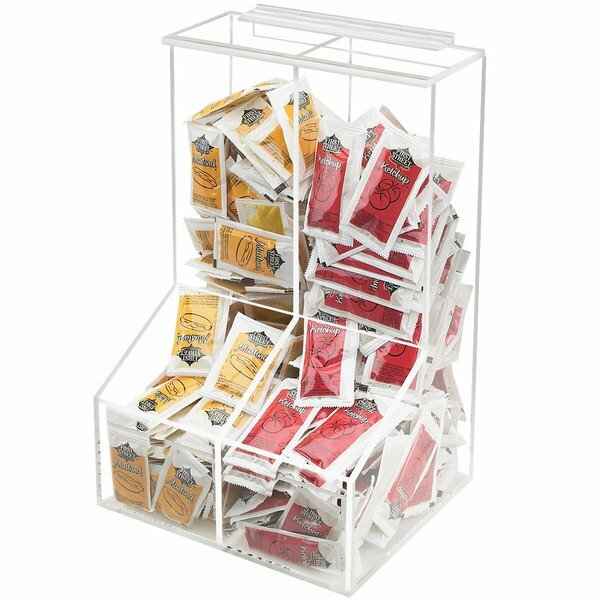 Cal-Mil 925 Clear Two Bin Top Loading Condiment Packet Holder - 8 1/2" x 4" x 12"
Display your packets of ketchup, mustard, relish, mayonnaise, and lemon juice efficiently with the Cal-Mil 925 two bin condiment packet holder. Its simple, two bin design features individual top loading compartments to ensure a first in, first out rotation. This condiment packet holder is ideal for large self-service use such as in convenience stores, buffets, cafeterias, and delis. Overall User Rating: Cal-Mil 925 Clear Two Bin Top Loading Condiment Packet Holder - 8 1/2" x 4" x 12"